Bell Tower Birding: Keeping an eye on Poe's "Tell-tale Heart"
Keeping an eye on Poe's "Tell-tale Heart"
I devoted some of my time recently to submerge further into the early writings of Edgar Allan Poe and discovered further proof of his connections to and profound knowledge of zoology, with a special emphasis on birds but also mammals. Amongst a pile of old books and letters in the vaults of the library was this early draft of what was later to be acclaimed as one of his greatest, most haunting stories: The Tell-tale Heart. "It is impossible to say how first entered the idea my brain; but once conceived it haunted me day and night. Object there was none. Passion there was none. I loved the old chipmunk. It had never wronged me. It had never given me insult. For its acorns I had no desire. I think it was its eye! yes it was this! Whenever it fell upon me, my blood ran cold; and so by degrees - very gradually - I made up my mind to take the life of the old rodent, and thus rid myself of the eye for ever." As cute as your old average chipmunk may look, there are some amongst the leaves on the forest floor that do affect us with their stare, like this one I came across while wandering through the wilderness of the Sleeping Bear Dunes National Lakeshore early last November, and it is thus easily perceived why Poe ventured upon rendering this side of the chipmunk immortal. Surely due to the pressure of selling more copies of his works to make a living, he later changed the subject of "the Tell-tale Heart" from a chipmunk to an old man. "One of his eyes resembled that of a vulture - a pale blue eye, with a film over it." This comparison sent me on a wild journey towards the discovery of Poe's unexpected yet extensive knowledge on Neotropical birds. Which vulture, I asked myself, shows a pale blue eye? 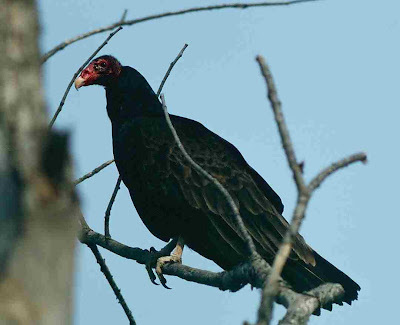 The first step towards the solution of this enigma was to refer to my photographic library in which I quickly found a picture I took of your average North American vulture, the Turkey Vulture (taken close to Ann Arbor in May 2005) which nowadays is the most common of North America's raptors and was surely comparatively common in the days of Poe. Upon close inspection, I discovered that this vulture's eye certainly had no affiliation whatsoever to the colour of blue. The same was soon found to be the case for Black Vulture, another bird likely to have been studied by the young and ambitious birder Poe, and even the California Condor. I was thus at first left clueless in regard of the species Poe is referring to and - having his English roots in mind - turned the focus of my investigation to the Old World Vultures. Amongst these species however, I equally failed in finding a species whose eye colour resembles the cold pale blue Poe is describing so vividly. It was only the Bearded Vulture that shows - as an adult - a pale eye that in some individuals may resemble a cold pale blue, but seems to lean towards a pale yellowish colour in most birds examined. Furthermore, during his time in England from 1815 until his return to Richmond, Virginia in 1820, Poe is not known to have travelled to the mountainous regions of southern Europe in pursuit of Bearded Vultures and it is highly unlikely that during this time he had the opportunity to study a vagrant bird in the surroundings of London. Having thus again utterly failed in identifying Poe's vulture, I turned my attention to the New World Vultures again, more precisely the purely Neotropical species as yet unexamined within my inquiry. Here I quickly succeeded to my great astonishment and surprise, and the species now clearly identified as the vulture embedded in literature by Poe's "Tell-tale Heart" is no other than the King Vulture of South and Central America. My discovery of Poe's vulture description referring to the King Vulture may indeed seem to add a significant piece to the puzzle regarding our understanding of the mysterious "Painted Vulture" described by William Bartram in the 1770s from Florida, not very long before Poe started his early work on the "Tell-tale Heart". Bartram's "Painted Vulture", initially thought to represent a population of King Vultures in Florida or an unknown and now extinct species closely related to it, is nowadays generally considered to be attributable to the Crested Caracara. A quick inspection of the Caracara's eye colour however shows that it does not resemble Poe's pale blue, making it unlikely Poe was referring to this species. If thus Poe is unlikely to ever have visited South or Central America to get acquainted with the eye colouration of the King Vulture, yet refers to this species in one of his tales, he might have come across a King Vulture on one of his travels through the South-East of the United States, supporting the identification of Bartram's "Painted Vulture" as a King Vulture. 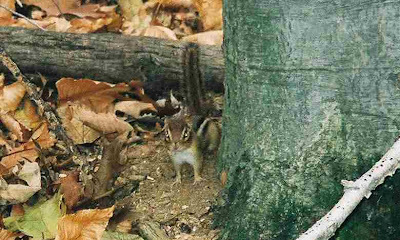 Finally, a quick word on chipmunks: one day in the summer of 1988, during my year as a high-school exchange student, I was watching ducks on the shores of Lake Ontario's Presqu'Ile Park when I felt something touching my feet. Upon looking down I noticed that a tiny chipmunk had walked through the grass and was now standing on my left foot, looking up to me in a state of surprise before it made a quick retreat into the grass. Back then I thought this was a wonderful and indeed cute event to have a wild and shy animal come up to you and stand on your shoes. How wrong I was is only clear to me now after reading the early draft of Poe's Tell-tale Heart. The little bugger was probably trying to sneak up and tie my shoelaces together and then watch me fall over into the lake at my next attempt at taking a step forward. 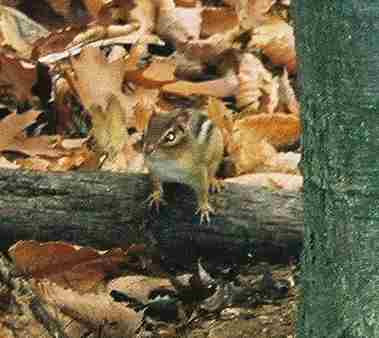 Chipmunks, I tell you, the Evil Eye. What a wonderful connection between Poe and King Vultures. I have an account from 1884 of a man I am about to do a powerpoint on; William "Bird" Butler that says he killed one near todays Juno Beach. I would be happy to share what I know of Mr. Butler so you may decide for yourself his credibility. Gimmi a shout, responses will be e-mailed to me.